EXCELEBRATION (IRE) (Bay 2008-Stud Ire. 2013, Aust. 2013). 8 wins-2 at 2, Ascot Queen Elizabeth II S., Gr.1. Half-brother to SW Mull of Killough. Sire of 205 rnrs, 110 wnrs, inc. SW Barney Roy (Royal Ascot St James's Palace S., Gr.1), Rebel Assault, Speak in Colours, SP Fulminato, Pellucid, Istan, Lincoln, etc. 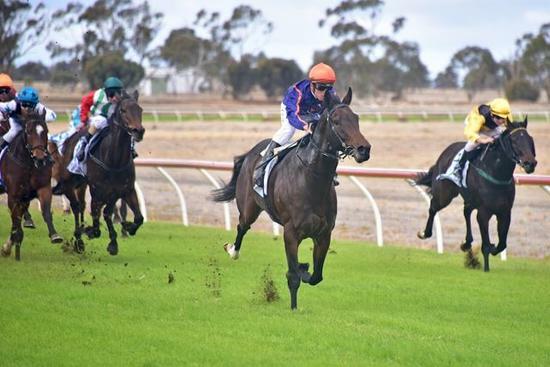 His oldest Aust.-bred progeny are 3YOs and inc SW Saint Patricks Day (BRC Dalrello S., L), SP Exceltic and of Excelamour, Exceltara, Royal Celebration, Getty - Wakey (H.K. ), etc. Skelton (g. by Excelebration). Winner. See below. THE OFFER (Montjeu). 8 wins from 1600m to 3200m, €36,875, A$1,553,600, ATC Sydney Cup, Gr.1, Chairman's H., Gr.2, Bendigo Cup, Gr.3, ATC NE Manion Cup, Gr.3, Ballarat Cup, L, Hawkesbury RC Rowley Mile H., L, 2d MRC Sandown Cup, L, ATC Blacktown Workers Club H., 3d Curragh Cup, Gr.3, ATC Randwick City S., L, Bartier Perry H., 4th City Tattersalls Club Cup, L.
Layl (Street Cry). 3 wins from 1600m to 2450m in GB and U.A.E, Meydan Sobha H., Meydan Fujairah Container Terminal H., 2d Meydan Al Maktoum Challenge Round 1 S., Gr.2, Evoque Trophy H., CEPSA Energy Cup, 3d Meydan Burj Nahaar S., Gr.3, Dubai Creek Mile, L.
MUSHA MERR - SHAAYF KHEER (Sau.) (Sadler's Wells). 2 wins at 2000m, 2100m in GB and U.A.E, Nad al Sheba Al Rashidiya S., L, York Glasgow S., L, 2d Deauville Prix de Granville. Sire. CYLINDER BEACH (Showcasing). 6 wins from 1350m to 2000m, A$536,850, to 2016-17, BRC Gunsynd Classic, Gr.3, Bernborough H., L, Qld Tatt's RC Recognition S., L, Toowoomba Cup, BRC Betfairy H., James Boags Premium P., 2d BRC Rough Habit P., Gr.3, Brisbane H., L, 3d BRC Sires' Produce S., Gr.2, Coca Cola Amatil 2YO H., ATC Bowermans Furniture H., 4th BRC JJ Atkins S., Gr.1. GALIPHAN (Halling). 8 wins from 1500m to 2800m in Turkey, Istanbul Fetih, L, 2d Istanbul Buyuk Taarruz, L, Ismet Inönü, L, 3d Istanbul Fetih, L, 4th Istanbul Celal Bayar, L.
HAKKAR (Halling). Champion 2YO Colt in Turkey in 2009. Champion Stayer in Turkey in 2010. Champion Grass Horse in Turkey in 2011. 5 wins-2 at 2-from 1400m to 2800m in Turkey, Ankara S., L, Istanbul Jockey Club of Turkey Cup, L, Celal Bayar, L, Sakarya, L, 2d Istanbul Basbakanlik, L, Çaldiran, L, Ismet Inönü, L, Fetih, L, 3d Istanbul TYAY Ve Sah Der, L, Sait Akson, L, Mimar Sinan, L, Preveze S., 4th Istanbul Erkek Tay Deneme, L.
Cool Star (Starborough). 6 wins from 1600m to 1800m, €258,530, Chantilly Prix de Chevrieres, Longchamp Prix de la Place Vendome, Prix Europe 1, Prix de l'Orangerie, Chantilly Prix de Brulis, 2d Saint-Cloud Prix Tantieme, L.
Valkena (Kendargent). Winner at 2000m, 3d Chantilly Prix Noailles, Gr.3. Race Record: 1 Starts 1-0-0 A$14,100. Winner at 1350m in 2017-18 in Aust.